The emerging woman ... will be strong-minded, strong-hearted, strong-souled, and strong-bodied...strength and beauty must go together. I want to do something splendid… Something heroic or wonderful that won’t be forgotten after I’m dead… I think I shall write books. Love Jo all your days, if you choose, but don't let it spoil you, for it's wicked to throw away so many good gifts because you can't have the one you want. M. Due to all of these pressures writing became a creative and emotional outlet for Alcott. Alcott was an abolitionist and a feminist. 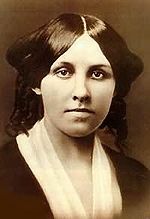 M. Louisa May Alcott (November 29 1832 – March 6 1888) was an American novelist best known as author of the novel Little Women and its sequels Little Men and Jo's Boys. PubliLouisa May Alcottd in 1868 Little Women is set in the Alcott family home Orchard House in Concord Massachusetts and is loosely based on Alcott's childhood experiences with her three sisters.